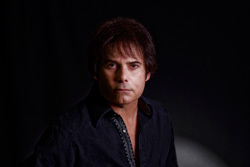 On the heels of the successful partnership with Toto vocalist Bobby Kimball, Kimball Jamison in 2011, Survivor vocalist Jimi Jamison continued working with Swedish musician, songwriter and producer Erik Martensson for his next solo album. Here's the result: Never Too Late. If you recall, Jamison career started in Cobra, an Eighties melodic hard rock band with a metal edge. Some of the songs ring with that heavier caliber, like I Can't Turn Back or Street Survivor, by example. Yet these songs never lose that accessible AOR quality either: strong melodies, big hooks in the choruses and soaring guitar licks. Leaning more towards the milder AOR melodic rock are songs like Not Tonight, Calling the Game, or Bullet in the Gun, but even these crackle with heavier fire in parts. Jamison would not be Jamison without including a rock anthem, The Air I Breathe, a soaring ballad, Heaven Call Your Name, and a motivational track, Walk On. 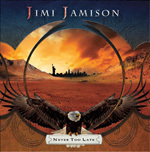 Essentially, on Never Too Late, you have two essential things: Jimi Jamison's strong and indefatigable vocals and classic AOR melodic hard rock. What could be better? It's Eighties deja vu all over again. Recommended. Essentially, on Never Too Late, you have two essential things: Jimi Jamison's strong and indefatigable vocals and classic AOR melodic hard rock. What could be better?